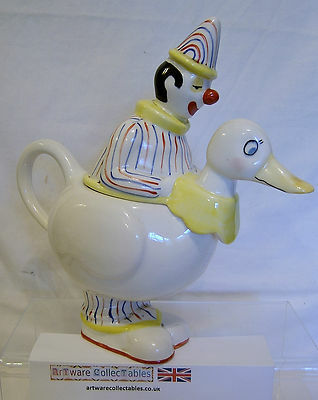 The Cream Jug is based on a white ground where the Clown has red, white & blue stripes for his baggy suit and a similarly decorated peaked hat. It stands 8.25 inches (21 cms) tall to the top of the hat and it has a length (width) of 8 inches (20 cms). It is in excellent condition with just the slightest evidence of crazing.